Find out how easy soufflé can be with our Easy Three-Cheese Soufflé. This Easy Three-Cheese Soufflé is made with Parmesan, cream and cheddar cheeses. Spray 1-1/2-qt. soufflé dish with cooking spray; coat evenly with 1 Tbsp. Parmesan. Blend egg yolks, milk, cream cheese, cheddar and remaining Parmesan in blender on high speed 30 sec. or until smooth. Pour into large bowl. Beat egg whites and cream of tartar in separate bowl with mixer on high speed until stiff peaks form. Gently stir into cheese mixture; pour into prepared soufflé dish. With tip of spoon, make slight indentation or "track" around top of soufflé 1 inch from edge to form "top hat." Bake 35 min. or until top is puffed and golden brown. Serve immediately. 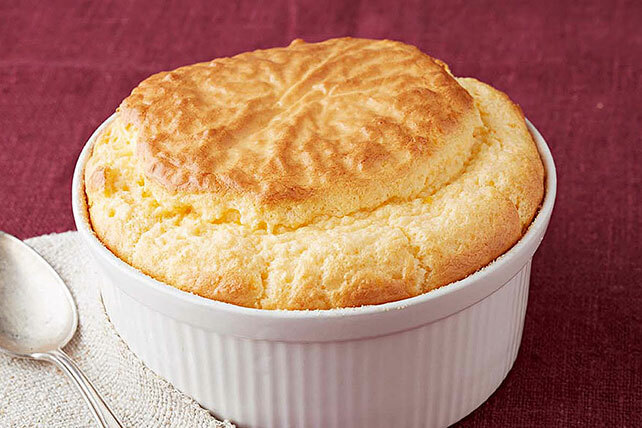 This impressive soufflé can be balanced out with a fresh fruit salad or crisp mixed green salad. If you don't have a soufflé dish, you can bake this soufflé in a 1-1/2-qt. casserole instead. Beat egg whites just until they do not move when the bowl is tilted. For best volume, use a glass or metal, not plastic, bowl when beating the egg whites.